According to ESPN, there are eight cities – New York, Philadelphia, Baltimore, Atlanta, Chicago, Houston, Los Angeles, and Seattle – which have the most important high school basketball teams. 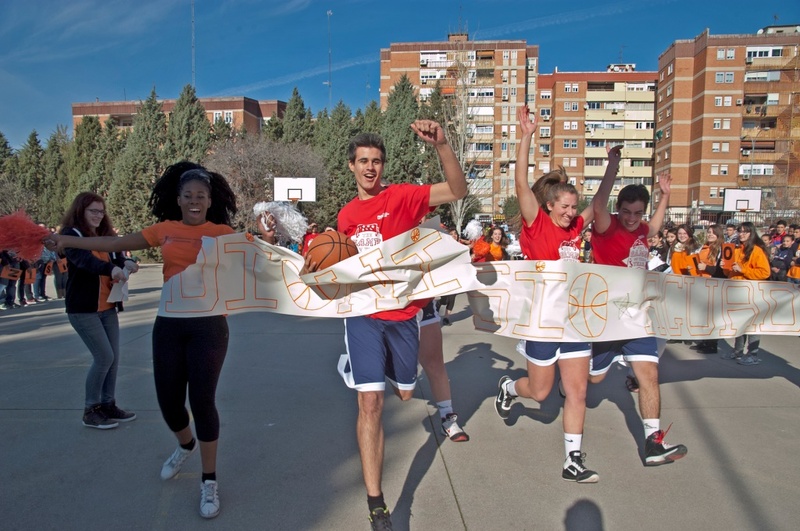 But after seeing the team created by IES Dionisio Aguado, we will have to tell them to add Fuenlabrada to the list. 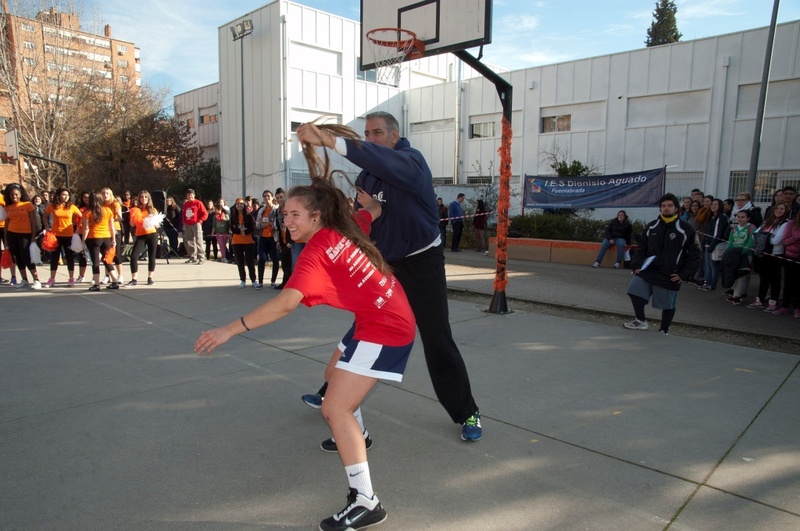 What we saw, with special guest, the great Joe Arlauckas, was a spectacular Pep Rally prepared in collaboration with Fulbright Assistant Emma Lamothe, to get ready for the game on December 17 against Dionisio’s rivals from IES Antonia de Nebrija in Mostoles. It was a crazy event, a huge affair…a “Dionisan” party! The crazy event started, in true American style, with the breaking of a Dioniso Aguado banner by the players, the cheerleaders, and the mascot, Dioni. 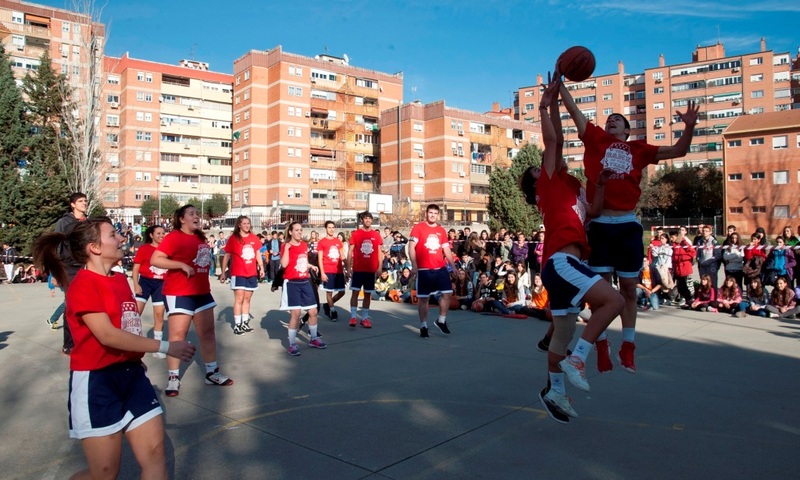 Next, Joe Arlauckas directed drills in which the players practiced passing, layups, plays, and defense (shout-out to number 23, Laura Martín, star basketball player!) while the cheerleaders entertained everyone with their awesome dances and the students cheered from the sidelines. Meanwhile, Coach Aníbal Sánchez gave a lesson about the fundamentals of basketball. A big moment for the Dionisios was when the players were challenging Joe—an experienced professional—to play one-on-one under the basket, showing that they are not afraid of anything.